Hundreds of Mexican farm workers protesting low pay clashed with police in San Quintin, Baja California, resulting in 30 to 70 injuries, according to various reports. The workers accuse the state of “violent repression” after mass police raids. According to a local indigenous leader, Justino Herrera, there were no deaths, but some injuries from the clashes are serious. The workers allege that police have been carrying out raids on their homes in the Ensenada municipality without authorization, which resulted in assaults on whole families – including children, according to the website La Jornada. The neighborhood of Nuevo San Juan Copala is some 180km from the city of Ensenada. The farm workers were reportedly protesting working conditions and low wages in the state. They had been preparing a strike, as their grievances had not been addressed for months, and some of the workers decided to blockade a tomato farm Sunday morning, asking their colleagues to join them on a picket line until next Wednesday, when the deputy secretary of the interior, Luis Enrique Miranda Nava, was to arrive. This was reportedly followed by the owner of the ranch calling the police, who arrived around 5:00 a.m. local time and allegedly started raiding workers’ homes with no warrants. Some reports claimed they were beating children while they were still asleep. Another version of events is that police officers chased escaping workers all the way to their homes. When other workers realized the raids were taking place, they took to the streets to resist the police, leading to violent clashes and the destruction of police equipment. Twenty patrol cars were reported to have entered the neighborhood, including an anti-riot vehicle that was later destroyed by farm workers joining the rally. Correa said that Miranda Nava’s failure to turn up was part of the reason things escalated into violence at the tomato farm. 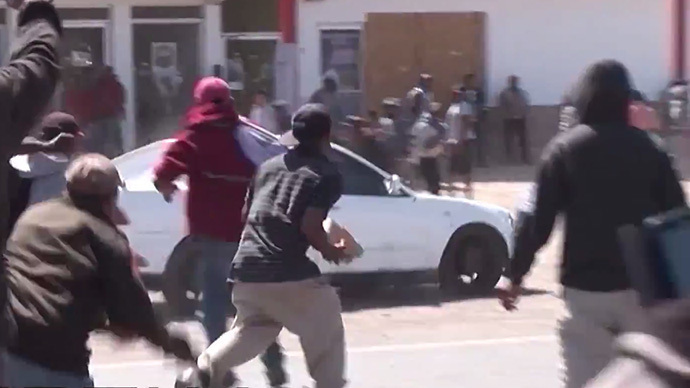 The farm workers had reportedly planned to hold a demonstration on Saturday, but were dissuaded from doing so by the fact that another, unrelated, but violent group of 200 men began blocking the freeway and attacking passing cars with sticks and stones. The workers allegedly had not wished to be associated with that group and called off their protest. An investigation into the events is under way, involving a human rights panel.